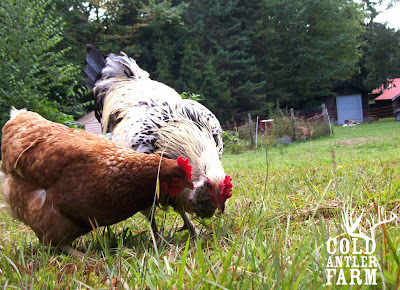 coldantlerfarm: good morning from the farm! This was the first day that required mittens with the morning chores. I'm back inside now, about to dive into an omelet and pumpkin coffee. Green Mountain Coffee puts out this Pumpkin Spice flavor that I look forward to every year. And Wilcox (our Manchester-based ice-creamery..which i think is amazing) has pumpkin out for sale in the grocery stores. Both make the end of September a holiday. I like how these pumpkingy things are showing up as my own are turning orange on the vine. I can not wait for October. As for this giant omelet: I used the last of my humble tomato crop, homemade cheese, a local dairy's milk and my hen's eggs. Together, they sing. Every bite has a history. A hen, a seedling, an evening stretching curd. I'm hoping to find a big steel pot at some yard sales today for more cheese making. I think I'm hooked. Today's a big day. I have errands in town, but then this afternoon a few folks are coming buy to help put up the new fencing for the sheep pen. I also have a cord of fire wood to stack and need to clean out the garage for winter hay storage. So it'll be a big long day (thus the giant breakfast) or running around and working, but hopefully by the end of this weekend there will be new strong fence and a garage stacked with hay bales. So here's to a crisp morning, hard work, and a warm breakfast. Have a good day, and good luck with all your projects. I'm glad you have some help with your fencing. PS I'm also going to be using the last of my tomato crop today (for dinner). Sounds like a good day in your neck of the woods. I will keep you in my thoughts as we do our work around our farm today. Work hard... Dawn from Wisconsin..
Aaahhhh the taste of pumpkin. I love it in just about everything. Your comment about pumpkin spice coffee just made me salivate. As did your description of the omelet you were about to enjoy. It sounds (and I'm positive, tastes) so much better than stopping at Waffle House or IHOP for an anemic egg and watered down cofee. Most people have no idea what they are missing. Your day sounds pretty full, but doesn't it give you a great feeling to look back at a hay filled garage, a nicely stacked wood pile, strongly fenced livestock, and know your effort created the change? I don't think there is any better sleep in the world than that which comes after hard honest work on your little piece of world. Three cheers for god, strong fencing! PS congratulations for being chosen for Crunchy's book club! That sounds like a wonderful day. I think I'll go outside and pull some weeds. Exactly the way we're spending our day here on our little farm too! What a blessing. if you really are getting serious about cheese making, check out all the stuff available at the New England Cheesemaking Supply Company at http://www.cheesemaking.com/ They have books too. Everything. Enjoy! hope it was a good day! i know what you mean about the food and it's history, and glad to know i am not the only one who thinks like that! My pizza last night was history as well. Did you find a big pot? have you made yogurt yet? Love pumpkin! my 3 are quite small this year...do not think they are growing any longer. Was 86 here yesterday and 64 today, go figure! Had a few friends over last night and I picked up some last minute stuff at the store. Been drinking some BLUE MOON lately and they had HARVEST MOON which has pumpkin and spice flavors. It was voted a thumbs up by those who chose that. Friends make beer, but I haven't been there when they've made their own pumpkin. Might have to make of point of showing up there this fall! I disremember which company makes a pumpkin protein shake, but they taste like liquid pumpkin pie. It's a limited edition--fall thru January it seems. Peruse the refrigerated case at your local food co-op. Nummy!